Walmart has agreed to pay $16 billion for a roughly 77 per cent stake in India’s largest online shopping site Flipkart, the US retailer’s biggest foreign investment as it battles rival Amazon.com in one of the world’s biggest emerging markets. “India is one of the most attractive retail markets in the world, given its size and growth rate, and our investment is an opportunity to partner with the company that is leading transformation of e-commerce in the market,” said Doug McMillon, Walmart’s chief executive officer in a statement. 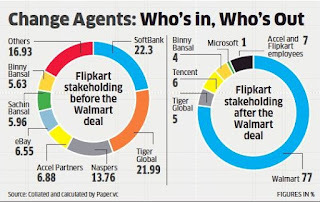 The remainder of the business will be held by some of Flipkart’s existing shareholders, including Flipkart co-founder Binny Bansal, China’s Tencent Holdings, Tiger Global Management and Microsoft, the company said. Google’s parent company Alphabet is also expected to purchase a small stake, possibly around 10 per cent, reports said, citing unnamed sources familiar with the matter. Son said his firm’s investment in the Indian online retailer had grown to $4 billion. Soft-Bank’s Vision Fund, the world’s biggest private equity fund, had invested $2.5 billion in Flipkart last August. Amazon boss Jeff Bezos has committed more than $5 billion to grabbing a big slice of India’s ecommerce pie after failing to make inroads in China. Flipkart was founded in 2007 by former Amazon employees Sachin Bansal and Binny Bansal, who are not related. Like Amazon, it started as an online bookstore. Before the deal, Flipkart co-founders Binny and Sachin Bansal each owned about 5 per cent, according to a Bloomberg analysis of the company’s annual return filed in Singapore. Sachin Bansal will sell his entire stake to Walmart while Binny Bansal will sell part of his to the American retailer, The Economic Times reported on Tuesday. The deal should give each a fortune of about $1 billion, although that status may be short-lived as the pair may have to pay 20 per cent capital gains tax on any shares they sell in the company, tax experts say. The pair have been billionaires before. Flipkart was valued at $16 billion in 2015, giving each Bansal a $1 billion stake at the time thanks to the 7.5 per cent they each held. They lost that status as the firm’s valuation subsequently dipped. It was valued at about $12 billion last year, according to researcher CB Insights. Walmart’s Walton family can afford to pay a premium for Flipkart. The combined net worth of Alice, Jim, Rob, Lukas and Christy Walton is $146 billion, according to the Bloomberg ranking.